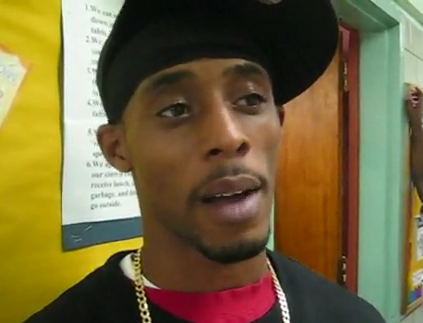 Parents speak out, see pictures of the rooms. One telling moment at around 6:32-6:45 — The charter schools kids are being lined up against the wall of the building. They’re obviously a little frightened in the hubbub and it is not clear why they have to be there at all instead of being taken inside. The demonstrators are certainly not preventing them from entering the building. One certainly has to question what’s going on here. On this very first day of classes, early at 6:30AM, the Community Public School 123, the Harlem Success Academy (HSA), an invading Private Charter School in the same public building on 141 St., and the Dept of Education (DOE), were unusually treated on the street to a excellent hands-on lesson in justice, equality and democracy. Arriving parents and children were greeted by a spirited yet outraged group of 25 parents, teachers from other schools, and education activists who picketed outside with signs and chants. Since the spring, PS 123 parents and teachers have been organizing against the disparities in treatment and are vowing to keep up the struggle to stop this discriminatory, unequal, and emotionally damaging learning environment. They have also vowed to continue to provide a successful education for their PS 123 students despite the unfavorable odds. About ten PS 123 African-American teachers stood close by in solidarity during Wednesday’s protest, but did not join the picket line. The fact that the UFT and DOE had asked them not to shows a total lack of leadership and insensitivity in the face of these glaring, unjust and stressful conditions at PS 123. Mr. Michael McDuffy, of the DOE Office that approves charters, was present but would make no comment. 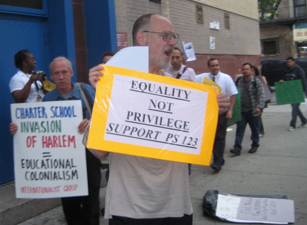 The invasion and takeover of PS 123’s public school space by Eva Moskowitz’s Charter School, facilitated by Mayor Bloomberg’s dictatorial control of schools, have divided this Harlem facility. It is important to note that by DOE standards, PS 123 was not even a failing school: it received a grade of A for 2008/9. Despite its obvious success, PS 123 students are not seeing the same kinds of classroom renovations and supplies that the lottery-selected HSA charter students have been treated to, even though all students share the same building. 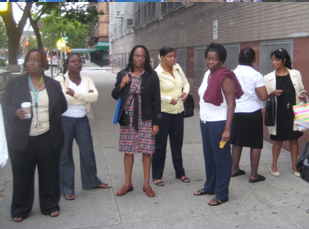 Upon returning to work this Tuesday, tensions flared up again when PS 123 teachers found their first and second floor rooms and corridors in an unwieldy mess (right). 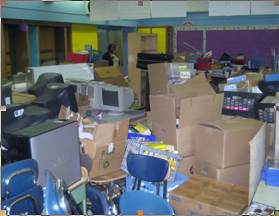 As the HSA charter took over the third floor this summer, their movers had evicted the PS 123 teacher materials and consequently left PS 123 books and supplies in disarray. The DOE, UFT officials, and politicians, all of whom had been apprised of the impending chaos, did nothing over the summer. At the start of this new school year, the HSA charter had its entire third floor facilities immaculately cleaned, freshly painted and newly supplied with modern lighting fixtures, toilets, doors, furniture, air conditioning, rugs and smart-board computer technology. HSA also has smaller class sizes. 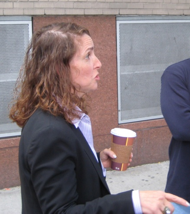 Moskowitz (left), who stood nearby welcoming students, pays herself $360,000+ yearly – a blatant misappropriation of monies that should be earmarked instead to upgrade services for all of PS 123. If Moskowitz had appropriated these funds under our public school system, she would have been indicted for grand larceny. Jitu Weusi, a member of the Coalition for Public Education, said, “Our protest shows that the public school community sectors are beginning to wake up and exert their voice for collective school governance. It’s a struggle between the attempt to privatize public education and an attempt to keep education public and equal for all — one system for all people. Not this stratified, a privatized system, creating classes within the community. ” Weusi urged parents to get involved and to take a firm stance against these charter school invasions, their attempt to privatize and to sow divisions among our people. Sonia Harris shared her insights, “Unfortunately disparity is suffered by our children. They will grow up thinking that this group is better than that one. It is not a good picture. Charters need to be regulated. Let’s mobilize and organize. We can do it. Make sure that everyone is served properly. That’s what Martin Luther King died for.” Hopefully, the irresponsible DOE Officials will heed the words of this humble parent and learn a lesson in justice and democracy. « Parents form the "NYC Kids PAC"
We've got some opportunities to put a dent in the mayoral dictatorship over the schools. for my candidate recommendations for mayor, public advocate and comptroller in the September 15 Democratic Party primary. We, the voters, need to remember that we do have opportunities to support candidates that are pledged to curb mayoral control, audit the DoE, and to replace the parent-exclusion policy with more chances for parent input. I tried to contact you, but couldn't find an email address. Please write us: gemnyc@gmail.com. Hi AlisonWhat a btaeuiful and insightful position you take – I dream of a day when professionals both educators and medical will all be so insightful as to support parents in choosing the best path for their child instead of promoting ‘the one path’ – sadly here in the land down under I believe we have a loooong way to go to reach that goal.